What battery works with my robot? How long does it take to charge Neato Robot’s batteries? Where can I buy replacement batteries for my Neato robot? What is quick boost charging? How do I get the most from my Neato Robot batteries on Botvac Series and XV Series? I replaced the battery and it now seems to be charging slowly. How do I disconnect Neato XV’s batteries? How do I replace Neato XV Series Robot’s batteries? Can I use the Neato Li-Ion battery in my XV, Botvac or Botvac D Series robot? What if my Neato Robot can’t find its charge base? Sometimes my Neato Robot climbs up the charge base. Why? What Charge Base can I use with my Connect-Series Robot? Can I use the same charge base on different Neato XV Series robots? Are the charge bases for Botvac Series and XV Series robots compatible? What if the Neato Robot accidentally comes off the charging base? Is it normal that my robot occasionally blinks “charging” even when it’s unused and fully charged? What are the benefits of the Li-Ion Battery in Botvac Connected? Does Botvac Connected come with a Li-Ion Battery? How often do I need to replace my Neato Robot’s batteries? 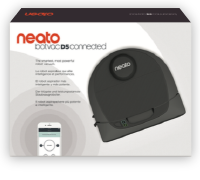 © 2018 Neato Robotics, Inc. Neato Robotics is a registered trademark and Neato, the Neato logo, Neato Botvac, Botvac D3, Botvac D5, Neato Botvision, SpinFlow, LaserSmart and CornerClever are trademarks of Neato Robotics, Inc. All Rights Reserved.